Dickens in December is hosted by Caroline at Beauty is a Sleeping Cat and Delia at Postcards from Asia. Wow. The book is just... wow. It is absolutely brilliant. I really couldn't write a lot about the book without revealing anything that a potential reader might not like to know beforehand. I hardly knew anything about the book before I started reading it, except perhaps that it was amazing. The twists and turns in the plot and the suspense definitely added to the reading experience. (From here) The novel depicts the plight of the French peasantry demoralized by the French aristocracy in the years leading up to the revolution, the corresponding brutality demonstrated by the revolutionaries toward the former aristocrats in the early years of the revolution, and many unflattering social parallels with life in London during the same time period. There was a reason I read The Old Curiosity Shop before I read this: I wanted to read something that not many people recommend, so that I won't be obligated even in the slightest subconscious way to like it - although I did find out later that The Old Curiosity Shop is a particular favourite among the Dickens aficionados. I loved it and when I began reading A Tale of Two Cities, the heavier prose (in comparison to TOCS) made me doubt, initially, that I would enjoy it quite as much. The book isn't enjoyable, really: the wry, twisted humour doesn't quite make it ha-ha-funny and the characters aren't as eccentrically realistic as in TOCS. The book is much darker and harder to get through; but that is the way it supposed to be: it couldn't have been otherwise. Though the book is about the Revolution, the fact that my knowledge of the world history is despicable didn't quite matter, as the ideas involved are far from redundant. Every revolution, every 'strike-back' must have that biased brutality, that makes you wonder just whom to consider the villian. It is heart wrenching and horrifyingly bone chilling and very graphic and gory and that is what makes it such a beautifully haunting tale. The themes and the characters are powerful, memorable: Sydney Carton has taken Levin's (Tolstoy - Anna Karenina) place as my favourite character in a novel. Their emotions, behaviour are terrifyingly genuine and saddening. I couldn't initially see what people meant about the first and the last lines of the book being perfect, but I do now. The beginning and the ending form a beautiful wooden frame that perfectly holds the story, a crinkly sparkly gift wrap, if you may. The ending of A Tale of Two Cities contains the very essence of the book and if not for anything else, I do think everyone should read it to its very last page to experience that. TOCS, though quite bleak, still had a touch of romance to it, something that made it unlikely to ever have happened: there aren't many Nells in this world, after all. On the other hand, A Tale of Two Cities as a historical fiction presents the sinister reality of the French Revolution in an unforgettable manner. This is a book I'd like to read over and over: I'm sure every read would reveal something new and even more amazing about the book. Wow, after reading this I want to read A tale of two cities right away. Happy reading and a happy new year! Glad you stopped by. Hi, sorry if this is a repost...I typed up a comment here and then had internet problems when I hit "publish." 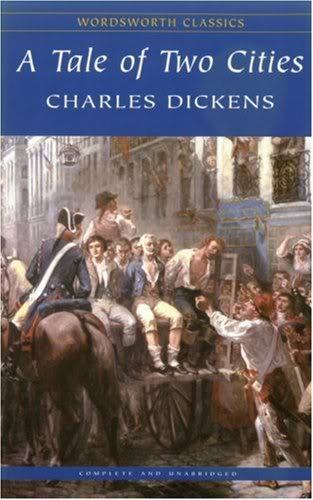 I believe what I was was that I read A Tale of Two Cities when I was way too young to really appreciate it. (Plus, I never liked being forced to read books.) I really should re-read it...I bet I'll like it a lot more this time around!